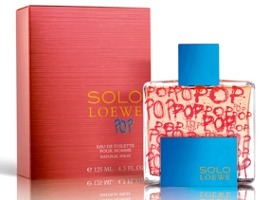 Loewe has launched Solo Loewe Pop, a new fragrance for men inspired by the pop art movement. Solo Loewe Pop is a flanker to the brand's popular Solo Loewe (2004). The fragrance notes feature tangerine, (pink or red, not sure which) pepper, basil, verbena, rosemary, lavender, coriander, thyme, vanilla, musk, vetiver, tonka bean and frankincense. Um… the Pop Art movement of the 1950s-60s had nothing to do with graffiti. Just being pedantic. Maybe they’re referring to some other , lesser-known Pop movement. The modern, graffiti-based pop art movement? Seriously, no idea what the point is. Nice looking bottle though! I’m really digging the box, myself. Love that design. Love the box, then turned my head to the right and saw the godawful bottle. Sheesh. This is more youth and modern version of the original Solo. Definitely Solo Pop is Solo without that old-fashioned drydown. Very, very good flanker. Good to hear it, thanks! That bottle is hideous. Did they forgot about snap and crackle? Looks a bit like Bond No. 9’s Brooklyn bottle. Or a child’s pencil case. I think I’m the only one that likes the bottle! I’m speechless for the color combination, in a bad way. Loewe used to have great sense of color palate. What’s wrong with this one? I am so clueless that I thought this was a new fragrance from the Loew’s Cinema chain, and it was called Pop because you eat popcorn at the movies … quelle stoopide!